FlowTube™ has numerous benefits: one of the key benefits is that the range of steel tubes, rapid assembled connecting joints and brackets, roller tracks, accessories and parts are totally reusable. It is an extremely versatile solution that lets you customise virtually any application for storage, assembly, manufacturing, distribution and material handling. The applications and solutions are compatible with requirements in industry, office, retail, education and other institutions. As FlowTube can be simply modified and reused it is totally compatible with the Kaizen philosophy of continual improvement and Lean Manufacturing environments. This simple-to-use solution will simplify your processes, increase your productivity and decrease your costs and gives a highly positive return on investment (ROI). We will help you every step of the way. We can draw your diagrams and build your applications for you, or show you how easy it is to assemble and create your own cost-effective solutions. Click here to see how easy it is to build FlowTube. 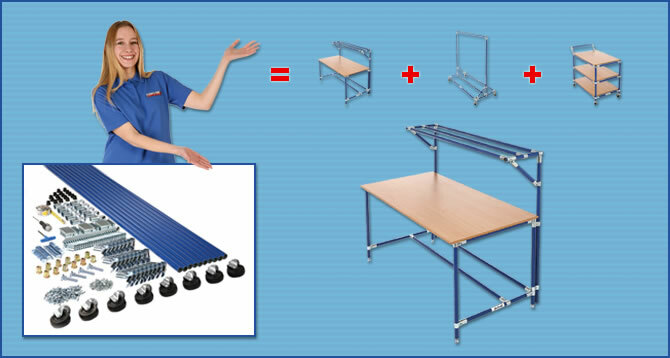 Fully flexible and versatile modular system - structures are assembled rather than welded. No special tools required - just a tape measure, tube cutting tool and a 5mm allen key. Click here to download a FlowTube brochure or contact us and we will be pleased to send you one. FlowTube™ benefits virtually every fundamental business criteria from the bottom line and value of investment, staffing requirements, space requirement, application, longevity, versatility – to name but a few. The durable and versatile nature of FlowTube lets you build a wide variety of customised applications and solutions for virtually any business environment.